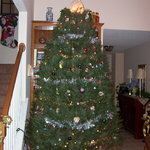 Our Christmas tree, decked out festively. My desk, complete with festive printer! Kyle's desk at NI - very festive! An even more festive view of Kyle's desk. I think I'm done with the word "festive" for now, but we'll see! Mom came up to Austin for a conference, and this was at the hotel she stayed at. And it snowed! Indoors, even! See? 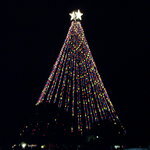 Later we went downtown to the Austin Trail of Lights - here was the big tree of lights from a distance. And here it is from underneath it. Looking up like this can make you dizzy! 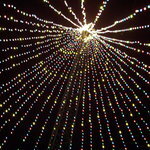 The front of the Trail of Lights. Pretty! A neat globe of lights. A big tree all neatly lit up. A view from a distance of more lit-up trees. 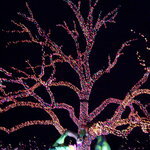 The end of the Trail of Lights. 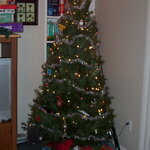 These are pictures from home and David's place. Here's the friendly 8 foot tall inflatable snowman in the front yard! 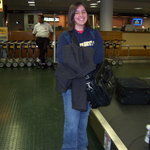 Jessi, when we picked her up from the airport. 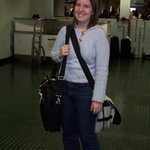 Carrie, when we picked her up from the airport. Neither one was thrilled about having their picture taken, but that's how it goes! 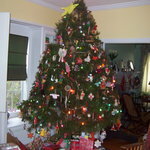 The decorated tree at David's place.